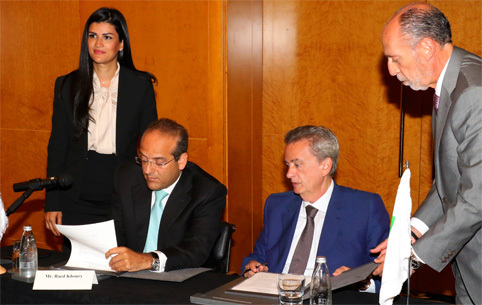 The MOU was signed respectively by the Minister of Economy and Trade, Mr Raed Khoury, and the Chairman of the CMA, Governor of the Central Bank, Mr Riad Salameh, during a ceremony in which the ICC was represented by its Acting Head Mrs Nadine El Habbal Assali, and the CMA by the members of its Board of Directors. The ceremony was attended by a number of General Directors, the President of the Association des Compagnies d’Assurance au Liban (ACAL), the Chairman of the National Bureau of Compulsory Insurance, and the President of the Lebanese Insurance Brokers Syndicate. HE Mr Khoury stated that the MOU is definitely a step in the right direction, and that its importance stems from the fact that it is the first MOU of its kind between two independent supervisory bodies, and hoped that further similar cooperation will take place in the financial marketplace. Mr Khoury mentioned that large efforts were deployed by both parties to reach this agreement, given the complexities in the supervisory work on insurance companies and brokers, and the importance of the supervision on financial instruments, where both regulators aim to protect the investments of the policyholders. He further announced that the ICC is working on a number of projects which would certainly lead to significant growth in the insurance sector boosting its penetration in the national economy to levels comparable to the developing markets. The Governor of the Central Bank, Mr Riad Salameh, highlighted the importance of strengthening the capabilities of the regulatory authorities in protecting the savings in different financial instruments in ways that would minimise the systemic risk in line with the stipulations and objectives of Law 161. Mr Salameh pointed out that the adoption of the principle of holistic and complementary supervision between different supervisory bodies is aligned with the current international trends which emerged after the financial crisis of 2008-2009; this would boast the confidence of the investors in and issuers of financial instruments, and safeguards adequately their investments. The Governor mentioned that the MOU ensures compliance with a fundamental requirement for the membership of the CMA in the International Organisation of Securities Commissions (IOSCO), which stresses the importance of implementing a holistic supervisory approach covering the entire spectrum of activities in the financial marketplace, and the strengthening of the supervisory capabilities to contribute positively in the financial markets and the economic growth more generally. It allows the abolishment of unwanted investments and financial instruments, which may cause financial losses to policyholders. She observed that the cooperation between the ICC and the CMA has just commenced, and will reflect positively on the insurance sector through an improvement of the services to policyholders. How the effectiveness of the cooperation between the two supervisory bodies will be assessed and reviewed to accommodate the ever-changing insurance market and continue to protect the policyholders in an adequate manner.